As multi-sensor measuring machines keep evolving, it is imperative to consider decisions that meet today’s manufacturing needs, but also years into the future. The evolution of metrology technology is inevitable and ultimately will improve the efficiency, consistency and accuracy of component measurement. Industrial-grade measurement machines can last many years by understanding your business needs today, and anticipating the needs of the future when considering specifications for sensor technologies and metrology software features. These decisions will increase productivity now and in the future. 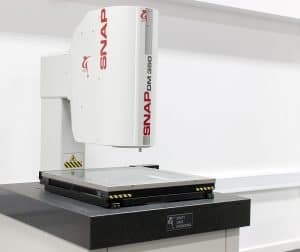 Introducing the latest non-contact digital measurement machine with large volume part measurement capability- the SNAP DM350. SNAP combines a high resolution digital metrology camera with built-in zoom alongside specially designed optics and lighting to produce high accuracy images. Its video-based 2D co-ordinate metrology system means the SNAP DM350 is able to measure any part within its 100 mm circular field of view.